You can play The Deal on our desktop client and mobile app. In the downloadable desktop client, click on ‘The Deal’ icon on the lobby’s right-hand side menu. In the mobile app, The Deal can be found under ‘More’ (iOS) or ‘Menu’ (Android). Please note that at this time The Deal cannot be played via the website. You must log into the mobile app or downloadable desktop client to play. The better your poker hand, the bigger your prize! Unsure of the ranking of poker hands? Click here for a handy guide. Reach the Jackpot Round and you’ll spin a wheel for huge cash prizes, including the ever-growing progressive jackpot! Hit the jackpot and 50% of the jackpot prize money will go straight into your Stars Account. The other 50% will be divided between everyone who has played The Deal in the previous 12 hours. 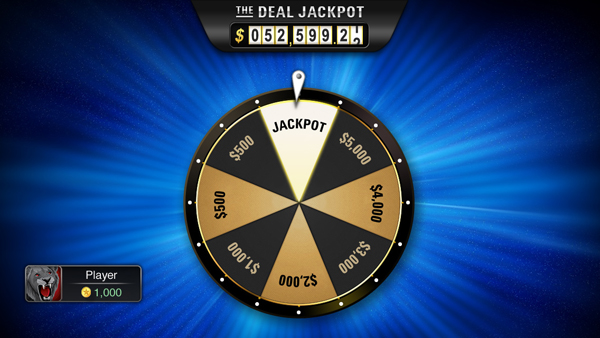 All Stars players are eligible to play The Deal and win the jackpot. Players who choose to play only one hand will be dealt seven cards face-down and will be asked to discard two cards. Players who choose to play more than one hand will have their cards selected automatically. In both instances the prize a player wins will be based on the strength of the five-card hand that is subsequently revealed. Prize details can be found in the prize table above on this page. All prizes won via The Deal are automatically credited to winning players’ Stars Accounts and cannot be exchanged for alternative prizes.